TOKYO, Japan – January 22, 2019 – Leading semiconductor test equipment supplier Advantest Corporation (TSE: 6857) has announced its newest photoacoustic microscope, the Hadatomo™ Z. Noninvasively acquiring blood vessel information within the dermis, the system visualizes the vessels as 3D images at high speed. Visualization of vascular network within the dermis is difficult with conventional imaging techniques, which have low resolution or shallow measurement depth. The new system is able to display 3D images of the vascular network by determining blood vessel structures with photoacoustic waves and dermis structures with ultrasonic waves. It then superimposes them to render 3D images with high resolution improved by a newly designed ultrasonic sensor. Information on blood vessels within the dermis is important for developments in the beauty and cosmetic field as well as the medical field. This system contributes to delivering that information as an evaluation tool with a groundbreaking new concept. 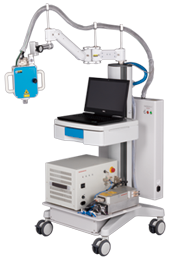 The Hadatomo™ is a photoacoustic microscope with great portability and excellent operability, equipped with a measurement unit mounted on a flexible arm, built on a system unit with caster wheels. The new Hadatomo™ Z can radiate photoacoustic waves with two different wavelengths alternately, adding new capacities that go beyond conventional single-wavelength blood vessel analysis: It can distinguish arteries from veins, as they have different oxygen coefficients. When two photoacoustic waves with different wavelengths are radiated alternately, arteries and veins show different absorption coefficients. Oxygen saturation can be calculated with these absorbing coefficients. Ultrasonic measurement is suitable for analysis of the epidermis/dermis, including unevenness of skin, or pores, or sebaceous glands. The Hadatomo™ Z conducts ultrasonic measurement and photoacoustic measurement simultaneously. It superimposes blood vessel structure images, obtained by photoacoustic waves, and dermis structure images, obtained by ultrasonic waves. As a result, accurate blood vessel location images can be displayed in 3D, to a depth of 3 millimeters within the dermis. Information on blood vessels within the dermis is indispensable for research and development in the beauty and cosmetic field or medical field, including vasodilation or blood circulation promotion caused by serums or beauty treatments, or monitoring of blood vessel regrowth caused by skin cancer. The Hadatomo™ Z will contribute to R&D in these areas with high-resolution images not previously obtainable with any tool. The Hadatomo™ Z will be exhibited at COSME Tech 2019, to be held at Makuhari Messe, Japan, from January 30th. It is scheduled to begin shipping in April 2019 to customers in Japan, Europe, South Korea and China. Guests are invited to experience the performance of the Hadatomo™ Z at the exhibition. Human skin consists of two layers, the epidermis and the dermis. The epidermis extends down several hundred micrometers from the surface, followed by the dermis which extends down several millimeters, covering subcutaneous tissues. The blood vessels visible to the naked eye beneath the skin are veins located in the subcutaneous tissues beneath the dermis. However, within our skin, especially in the dermis, there are countless blood vessels of diameters ranging from several micrometers to several hundred micrometers, building a complicated network that is invisible to the naked eye. There had not been any effective measurement equipment to analyze the structure and mechanism of these blood vessels within the dermis until, in 2015, Advantest introduced the photoacoustic microscope Hadatomo™, a new evaluation tool for blood vessels within the dermis. The first generation Hadatomo™ could obtain clear images of the blood vessel network within the dermis. However, it was difficult to identify arteries, veins, and melanin, because measurement was done using photoacoustic wave with only one wavelength. Medical doctors and researchers requested improvements to the system, including epidermis/dermis information such as unevenness of the surface or component information such as body hair, and clear images of the microvessels in the epidermis. To meet these requirements, Advantest developed the new Hadatomo™ Z system. Multi-modality A single system enables measurement with a dual-wavelength photoacoustic wave method, to distinguish arteries and veins by oxygen saturation, and an ultrasonic wave method, to visualize dermis structure by measuring differences in hardness of components. Quasi-real-time imaging The photoacoustic wave images and the ultrasonic wave images are measured simultaneously, with a minimum measurement time of 40 seconds (Range: 6 mm × 3 mm × 3 mm (depth)) and maximum time of 210 seconds (Range: 6 mm × 6 mm × 3 mm (depth)). High-resolution images obtained with easy operation An ultrasonic sensor developed especially for this system provides a high-resolution cross-section view. Focus points can be easily located by observing the cross-section. Flexible design with easy operation and portability The compactly designed system, equipped with a measurement unit mounted on a flexible arm, is installed on a system unit with caster wheels, easy to set up to measure various parts of the body. Label-free Applying a small amount of water to the measurement area is enough for measurement. Non-invasive measurement is possible without any contrast agent. Acquires data for 3-dimensional imaging Measurement data are displayed as 2-dimensional cross-section images in real-time, and acquisition of 3-dimensional data images is possible. 3-dimensional image analysis is possible with customer-provided rendering software.